Technology is rapidly evolving and so are the hackers! Hackers always stay one step ahead to get past the latest security updates on your system or device. Ignoring the security of your device will open the door of your premises for hackers. So, keeping the device secure should be your priority and first precautionary measure against cyber criminals. 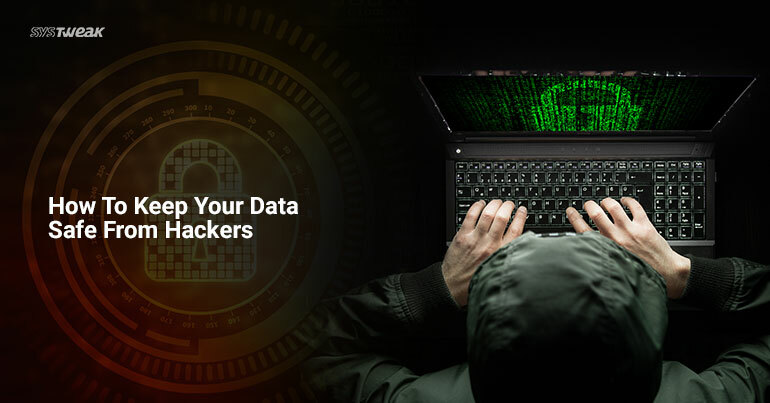 Today, we are going to discuss how to keep your data safe from hackers. It is highly recommended to update your device frequently to avoid hackers from accessing your computer through vulnerabilities in outdated software and programs. Moreover, it fixes bugs and gives the device tougher security. Keeping your computer updated not only gives you a better performance but also allows you to advantages of newest version and functionality. Using a password to unlock your device is the best method to prevent an outsider from accessing your data. Furthermore, it is useful when your device gets stolen. It doesn’t matter which device you use, password protection is required on all the gadgets whether it’s a smartphone, smartwatch, laptop, desktop, or tablet. Some of the users tend to save their passwords to online services and websites on their device but it is not suggested to keep your important passwords saved in your device particularly when it comes to banking or payment apps. Creating a backup of your data is an amazing way to make sure you won’t end up losing your valuable data at any cost. Use automatic backup software to backup your data regularly. Right Backup is a simple, easy and highly secure cloud storage solution for your valuable data that keep you safe and make your online backup experience perfect. The software automates certain processes to make it easier for you to back up the items you need to quickly. If you have got your device completely backed up, you can retrieve your saved information when your device is stolen or lost. Isn’t it great? No matter how prudently you maintain and use your computer, you still need to focus on some strong protection to safeguard your device from malicious apps and software. Anti-Virus software helps you secure your devices against virus, rootkits, botnets, worms, and other unwanted invaders that can make your computer weak and defenseless. Moreover, it is the best way to keep your laptop healthy and helps to detect and remove the virus. Make sure you don’t run two antivirus programs at the same time, as it might slow down the speed or crash and always keep in mind uninstall the previous anti-virus software before you download new one. It is highly recommended to install and download apps from the trusted sources to protect your device. Downloading third party apps from untrusted websites is one of the biggest reason of getting infected with virus and malware. Downloading apps and games from App Store and Google Play Store can certainly lower the risk of getting any malware on your device. People don’t realize that they make their devices vulnerable when they use public Wi-Fi and unsecured networks. Well, when you use such networks it is easy for hackers to sniff out your pockets and get your private information and passwords. A firewall is an inbuilt security program that acts as a barrier that controls the traffic that comes in and goes out the network. Firewall is configured with precise criteria to block unauthorized access to a network. These can be either in the form of software or hardware. In short, firewall works as filter for your network traffic by blocking the incoming packets of information that are unsafe and harmful. Make sure when you’re not using your computer disconnect your computer from the Internet and shut it down completely overnight. So, these were the things you need to take care of to keep your data safe from hackers.